NFT, or Nutrient Film Technique, consisting of a very shallow film of dissolved nutrients in water. This stream is continuously pumped past plants’ bare roots, which provides a permanent exposure of the roots to a water supply perfectly balanced with essential nutrients and oxygen. Other systems have a conflict between plants’ essential requirements, often resulting in an imbalance of one or two requirements to achieve an optimum amount of one requirement. We took many years to perfect our NFT systems and, unsurprisingly, they’re Europe’s best sellers. See the setup instructions here (PDF). Well-designed NFT systems must have the right flow rate, the right channel slope, and the right channel length, allowing the run-off to flow back into your reservoirs. As very little grow medium is utilised, plants develop a very thick mat of roots. Without soil to restrict plants’ access to their growing essentials, this allows for the constant exposure to water, oxygen, and nutrients - the main advantage of these hydroponic systems. The result? Higher yields of a higher quality produce and a much longer cropping period. Often considered ‘pure hydroponics’, Gro-Tanks are the system to choose for unrestricted oxygen access by plant roots. The nutrient solution circles continuously from the reservoir and into the roots located in the planting channel. The cycle continues as the nutrient solution cycles back into the reservoir, ready to be pumped to the roots again. Triple the Yields: The continuous water and nutrient supply to the roots and the unrestricted oxygen access provide three-times the yields as other traditional soil growing methods. Zero Waste: With the initial rockwool block the plants start in being the only growing medium utilised, there is a very reduced likelihood of disease and waste thrown away. More for Less: At just 20cm tall, these tanks offer more from a smaller space. Healthier Plants: Always well-fed and properly watered, plants never experience salt build up at the roots. See more tips and FAQ here. 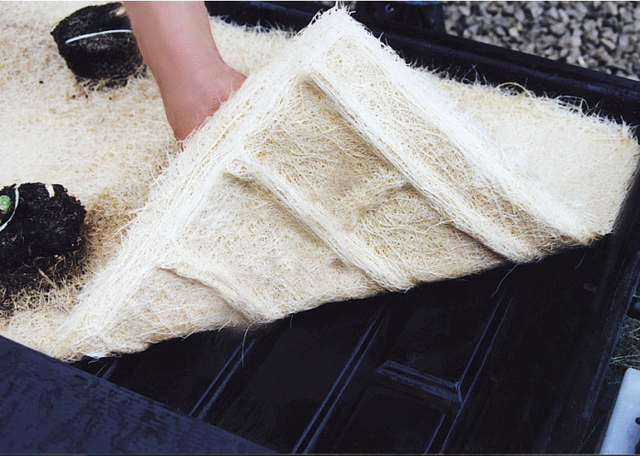 Plants need to be well-rooted before going in the NFT system, which translates to the started grow media needing to be covered in white roots. Plants should be started in either rockwool (in 3-inch or 4-inch cubes, completely removing the plastic), clay (in 3-inch net pots), soil or coco (in 3-4-inch pots). The general rule is to have one plant per square foot, depending on plant variety. Make sure to leave the pump continuously running. Don’t leave your plants in their pots when moving them to your NFT Gro-Tank, as this can hinder plants’ access to oxygen. Every two to three weeks, make sure to adjust the pH level and change the solution so that both pH and EC are balanced. When placed under lights, plants tend to take up water much faster than nutrients. This translates to an increase of EC over time. To overcome this, top up the tank with a half strength solution of nutrients, check to see how the EC is, and hen adjust nutrients if needed. Tip: NFT Gro-Tanks work brilliantly with the Hydroflow Auto Top-Up Kit. Contact us to know more about our hydroponic systems. Our team is always happy to answer any query you might have.